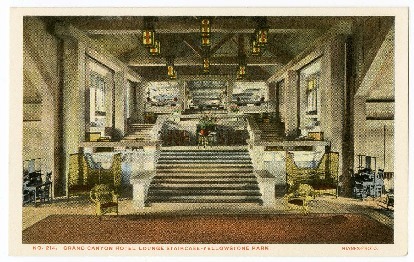 Hand-colored tinted photograph postcard of Grand Canyon hotel, lounge staircase, Yellowstone Park, ca. 1920. Number 214. Haynes, St. Paul official photographer of Yellowstone National Park. 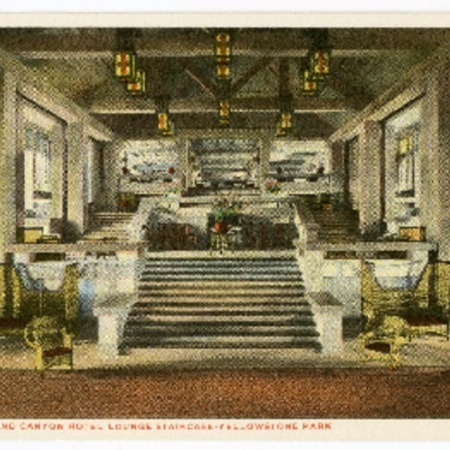 Haynes, Frank J., “Grand Canyon hotel postcard, lounge staircase, Yellowstone Park, ca. 1920,” Highway 89, accessed April 22, 2019, http://highway89.org/items/show/10211.